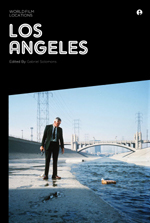 According to Gabriel Solomons, the series editor of World Film Locations and editor of the volume devoted to Los Angeles, “[w]hether as an elaborate backdrop to a directorial love letter or as time specific cultural setting, the city acts as a vital character in helping to tell a story”. These books highlight how specific aspects of the character of the cities of Los Angeles and London have evolved and explore how these aspects are represented in a wide cross-section of films. In the introductory essay to the Los Angeles volume, Michael S. Duffy cites the presence and the “’imagineering’” of the Hollywood filmmaking industry as a reason for the visualisation of Los Angeles as “both the destination of dreams and a psychological dead end …”. Duffy portrays the relationship between Los Angeles and Hollywood as an uneasy one, “at odds in form and function”, and asserts that, as a “’city of the imagination’”, Los Angeles is “much more ambiguous, dense, and rich with complexity than most perceive”. This premise is supported by a sampling of films that covers everything from Laurel and Hardy’s The Music Box (USA 1932) to classics such as Rebel Without a Cause (USA 1955), slices of gritty inner-urban African-American life like Killer of Sheep (USA 1977) and lighter entertainment, such as Clueless (USA 1995). In contrast, the editor of the London volume, Neil Mitchell, identifies London’s ‘psychogeography: the effects of the environment on emotional states’ as a unifying feature in films as diverse as My Fair Lady (USA 1964), My Beautiful Laundrette (UK 1985) and Nil by Mouth (1997). Mitchell’s description of disparate elements of London, such as its attractions as a tourist destination, parklands, middle class suburbs, blue and white collar working cultures and poverty stricken areas as “a geographical collision” and “fertile cinematic territory” is evocative. The selection of films makes it clear that directors looking for locations that emphasise subtext have found a lot to offer in London’s weather, its internationally recognisable landmarks and the upheavals that have left their mark on the city over many centuries. The books share a common, easy to navigate format and a tight structure. An introduction and an introductory essay are followed by six chapters (“Scenes”) where selections of from seven to ten films are grouped chronologically, accompanied by a map of film locations. The editors stress that the selection of films is not designed to be comprehensive but rather to show the importance of locations in storytelling or (what Neil Mitchell describes as) “wider explorations of the relationships between the imagination, environment, imagery and film”. Part of the appeal of the books is that the films that have been chosen cover multiple genres and levels of seriousness. Each of the featured films (48 for Los Angeles book and 50 for London) has a double page spread. On the left side of the page there is a photo of the location as it appears today, a synopsis of the film, an analysis of a particular scene that has been shot at the location and a comment on the site’s symbolic or metaphorical significance in the film. On the opposite page, three to six film stills from the scene are presented, along with a one-line scene description and the timecode for the placement and duration of the scene. Each of the chapters/Scenes is followed by a succinct but authoritative essay that explores a significant aspect of filmmaking pertinent to the city. Film noir, the development of California Slapstick (film comedies of the silent era) and the impact of films such as Boyz in the Hood (USA 1991) are among the subjects covered in the Los Angeles volume. Included in the London volume are essays that focus on the Ealing Studios, the use of the London Underground in films and the rise of ‘mostly white, poverty-free London’ depicted in films such as Notting Hill (UK 1999) and Love Actually (UK 2003). The language that the contributors use is accessible and unaffected throughout. These full-colour, hardy paperbacks will attract a wide readership because of the packaging of good quality content into self-contained, easily digested chunks. The books are an ideal size for stashing into a gift bag or a traveller’s backpack for casual reading and they are also available as e-books. A comprehensive index of all of the films that are featured or mentioned is included, along with detailed information about the contributors (most of the contributors to the London and Los Angeles volumes are based in the UK) and their writing credentials. A list of books, films and websites is included for further research. According to the Intellect Books website, books in the World Film Locations series that have been published recently include the cities of New York, Paris, Dublin, Madrid, Tokyo, New Orleans and Istanbul. Vienna, Beijing, Reykjavik, Berlin, Mumbai and Melbourne are due for release later in 2012. It will be interesting to see if the approach that has worked so effectively for London and Los Angeles will translate across so many different locations and film cultures. There is probably no reason why it shouldn’t.